Gravity Die Casting (also called permanent mold casting )is the process of pouring molten metal into the mold under the action of gravity.It mainly refers to the metal mold casting. Metal mold casting is a kind of modern casting process using heat-resistant alloy steel for casting hollow casting mould. 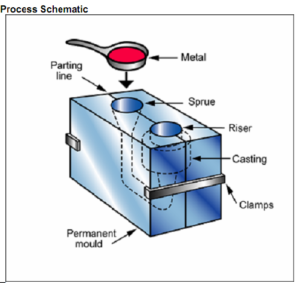 The metal mold can be either gravity casting or pressure die casting. The metal mold can be used many times, and every casting of molten metal gets a cast. It has a long life and a high production efficiency. The casting of metal mould not only has good size precision, smooth surface, but also has higher casting strength than sand mold and less damage. 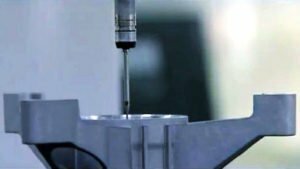 Therefore, in the production of large quantities of non-ferrous metal, small castings, as long as the melting point of the material is not too high, generally preferred to use metal mold casting. However, metal casting also has some shortcomings: because of heat resistant alloy steel and make a hollow cavity on the top of the processing is relatively expensive, so the metal mold is expensive, but the overall the cost of Gravity Die Casting mould are much cheaper than Pressure die castings. For small batch production, the cost of tooling to each product is obviously too high and generally difficult to accept. Because the metal mold is affected by the mold material size and the cavity processing equipment and casting equipment capacity, so it is helpless for the particularly large castings. As a result, metal casting is seldom used in small and large production. In addition, although the metal mould adopts heat resistant alloy steel, but the heat capacity is still limited, generally used for casting Aluminum Alloy , zinc alloy, magnesium alloy, copper alloy casting has been used less, and less for black metal casting. We can provide you with many kinds of gravity die casting parts, and all we need is your dimension or drawing. Our company devotes ourselves to forging, casting and die casting parts and we have a lot of oversea customers. If you have special demands beyond of above data on Gravity casting parts, please contact us for details. We will design each speical checking tool to control key dimensions of gravity die casting parts in every process. We can ensure each key dimension under control. A reliable and reputable supplier is a key to your successful business. We must be the best choice for you!